GREY SEALS: Mum with pup defending their patch on the beach from other seals. 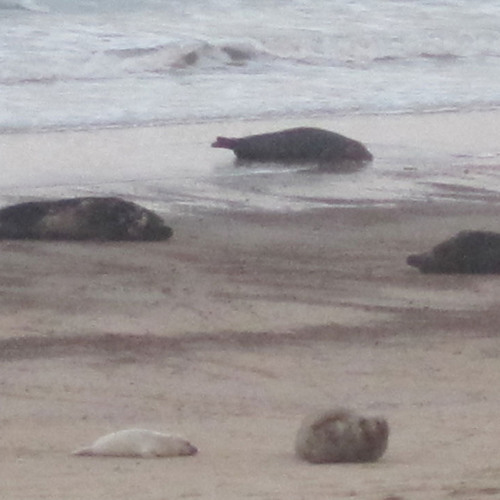 Every year around November / December on the North Norfolk coast, grey seals come on to the beach to give birth. No processing of any kind to this recording other than crossfades from the original nine hour recording. Your can hear the time going by, as the tide is coming in, getting closer to the microphone and so are the seals! Recorded on the North Norfolk coast, UK, November 2011. MKH30/40 M/S setup to a Edirol R4Pro recorder. Sounds like jazz to me! Wonderful recording. Much clearer and closer than mine. Thank you for sharing it. @wildearthvoices: Many thanks:) Always enjoy listening to your recordings too! What mic(s) did you use for this recording? AS THE TIDE COMES IN, THERE'S LESS SPACE ON THE BEACH AND THERE'S MORE CHASING! ANOTHER SEAL TRIES IT ON SPLASHING THROUGH THE WAVES! Users who like GREY SEALS: Mum with pup defending their patch on the beach from other seals. Users who reposted GREY SEALS: Mum with pup defending their patch on the beach from other seals. Playlists containing GREY SEALS: Mum with pup defending their patch on the beach from other seals. More tracks like GREY SEALS: Mum with pup defending their patch on the beach from other seals.